The digital workspace is a hot topic at industry events this year. And while a few offer a lot, only one delivers the experience, security, and choices that people and organizations need to unlock innovation and be productive — anytime, anywhere. Secure enterprise content in the cloud and on the device. Leading industry analyst Mark Bowker, Sr. Analyst, ESG and P.J. 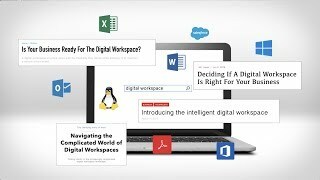 Hough, Chief Product Officer at Citrix discuss the new Citrix Workspace.